Screenshot/VICEGolden Division leader Major Salam asks locals to give up any intelligence they may have on ISIS sympathizers who may be in their midst. 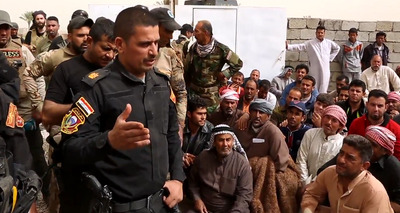 One of the biggest challenges facing Iraqi police as they try to recapture territory from the Islamic State comes in persuading local communities with a deep distrust of Shiite government forces to reveal any and all ISIS sympathizers living among them. That challenge was clearly exposed in a recent Vice News documentary produced by two journalists who embedded with Iraq’s elite counterterrorism force — the Golden Division Special Forces unit — on the frontlines in western Iraq’s Anbar province in March. Ayman Oghanna explains that the Golden Division’s leader, Major Salam, relies heavily on the men in local councils to determine who remains in their village and is sympathetic to ISIS. As the footage showed, many are eager to help. One local man swears to Salam that he would give up his own son if he knew he were an ISIS sympathizer. Another woman tells Salam that her son was killed while fighting with ISIS, and Salam swears he will avenge her son’s death by finding the local ISIS collaborators who recruited him. “His blood will not go in vein,” he says. The method becomes complicated, however, as the special forces enter villages where there is a high level of distrust for the Iraqi government — distrust that is often coupled with sympathy for ISIS. The hostility that greeted the Golden Division when they entered the town of Mohammadi represents perhaps the biggest challenge that has faced Iraqi government forces since ISIS swept Anbar province two years ago: how to regain the trust of Sunni communities, many of whom are more afraid of the Shiite dominated government and its security apparatus than of the Islamic State. That is the problem now facing Iraqi security forces not only in the ISIS stronghold of Falluja — which was the first city in Iraq to fall to the jihadists in 2014 — but also in Mosul, further north. Mosul, Iraq’s second largest city, fell to ISIS in June 2014. In an interview with Business Insider before the documentary was released, photojournalist Warzer Jaff — who was also embedded with the Golden Division and shot the Vice News documentary — said that a predominantly Sunni unit within Iraq’s special forces unit will need to drive the offensive in Mosul if it has any chance of being successful. “The difficulties in liberating Mosul have as much to do with politics as with military strategy,” said Jaff, a former peshmerga fighter. For that reason, the Peshmerga and Shiite militias will need to remain well in the background during anti-ISIS offensives. “If Shiite militias have any part in retaking the city itself, it will be a bloodbath,” he said, referring to the Shiite militias that dominate Iraq’s state-sponsored Popular Mobilization Units (PMU). Many Shiite forces believe that civilians in ISIS-held territory are sympathetic to the jihadists, even though Iraqi security forces helped nearly 800 civilians flee Fallujah late last month. Because the PMUs have been one of the most effective forces fighting ISIS in Iraq, the Obama administration has not seriously challenged Iraqi Prime Minister Haider al-Abadi’s decision to allow the units’ Shiite militias to help drive ISIS out of its strongholds. But locals last month accused PMU fighters of killing 17 civilians in Iraq’s Garma district on the city’s outskirts, and reports have begun to emerge that Shiite militias tortured and “summarily executed” civilians as they tried to flee Falluja over the weekend. As a result, “many Iraqis will see the US as complicit in Shia militia atrocities in Fallujah, fine distinctions of air support notwithstanding,” Michael Weiss, co-author of the book ISIS: Inside the Army of Terror, wrote on Twitter. Iraqi and Western officials have insisted that the PMUs have taken only a secondary role in anti-ISIS operations, and that they have been ordered not to enter Falluja itself. But the leader of the Iran-backed Shiite Badr Organisation — the PMU’s largest unit — recently walked back an earlier promise not to enter the city. “Of course, we will go in and rid the city from the evil of this cancerous gland, with nobody preventing us,” the leader, Hadi al-Amiri, told reporters over the weekend. Currently, experts say, the main forces attacking ISIS in Fallujah are not the PMUs but Iraq’s multiethnic counterterrorism units, which are being assisted by local tribal communities. The offensive aims to be a prototype for the kind of cooperation between local and government forces that helped drive ISIS out of Ramadi last year. If Vice’s latest documentary is any proof, tensions remain — and often run high — between local communities and government forces. But it also provides some hope that the tensions may be overcome by a collective hatred for the militant Sunni group. “Following Major Salam these last few days, one thing that’s been very apparent is the active effort he has made to engage with the local population and tribal elders,” Oghanna says, before cutting to a scene of Salam and his men delivering aid and water to families displaced by ISIS. “I think the future will be better,” he said.